44 mm platinum case, 10.58 mm thick, sapphire-crystal back, Celestial dial with black sapphire-crystal disks for sky background and moon phases, transparent sapphire-crystal disk for sky chart and Milky Way, and blue sapphire-crystal disks for sky background and moon phases, caliber 240 LU CL C self-winding movement with date by hand, hours and minutes of mean solar time, sky chart, phases and orbit of the Moon, time of meridian passage of Sirius and of the moon, approximately 38-48 hours of power reserve, shiny navy blue alligator strap with square scales. Water resistant to 30 m.
44 mm 18K rose gold case, sapphire-crystal back, Celestial dial with black sapphire-crystal disks for sky background and moon phases and transparent sapphire-crystal disk for sky chart and Milky Way, caliber 240 LU CL C self-winding movement with date by hand, hours and minutes of mean solar time, sky chart, phases and orbit of the moon, time of meridian passage of Sirius and of the moon, approximately 38-48 hours of power reserve, shiny black alligator strap with square scales, fold-over buckle. 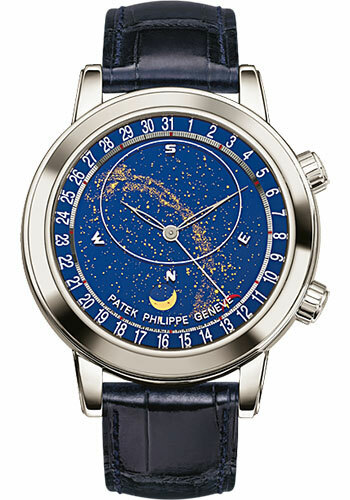 Water resistant to 30 m.
44mm 18K white gold case, sapphire crystal back, diamond bezel, Celestial dial with three metalized sapphire-crystal disc as well as ellipse framing the portion of the sky visible from Geneva, self winding caliber 240 LU CL movement with hours and minutes of mean solar time, sky chart, phases and orbit of the moon, time of meridian passage of sirius and of the moon, approximately 48 hour of power reserve, shiny navy blue alligator strap with diamond set fold-over buckle. Water resistant to 30 meters.